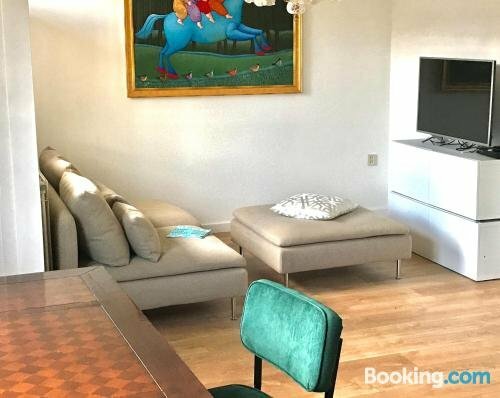 Located in central Maastricht, 2 Bedroom Appartment Centrum/Wijck Fresh And New is within a 10-minute walk of the Hoge Brug, the Bonnefanten Museum and the Sint Servaasbrug. The property is also conveniently situated within a five-minute walk of Maastricht Railway Station. The property provides a comfortable apartment, equipped to fit the requirements of any traveller. 2 Bedroom Appartment Centrum/Wijck Fresh And New is under a 20-minute drive from Maastricht Aachen Airport and Onze Lieve Vrouweplein is a brief stroll away. It is also within walking distance of the Museum aan het Vrijthof and Maastricht University.